Tire Shop Auction, Oshkosh, Neb., (970) 474-3693, (970) 520-5257 or http://www.MichaelAuction.com. Well Maintained Vehicles & Equipment Auction, Denver, Colo., (866) 515-1668 or http://www.RollerAuction.com. Internet Only Vehicle & Equipment Auction, (866) 515-1668 or http://www.RollerAuction.com. Household Consignment Auction, Wellington, Colo., (970)568-9828. HWY 85 Hay Auction, Ft. Lupton, Colo., (970) 785-6282, (970) 396-2099 or http://www.TroyerAuctions.com. Open Consignment Auction, Ft. Collins, Colo., (970) 482-6207 or http://www.CLAAuction.com. Combined Estate Auction, Ogallala, Neb., (308) 284-6563 or http://www.SchowAuction.com. Peever Moving Auction, Evans, Colo., (970) 356-3943 or http://www.K-WAuctions.com. Parrish Galleries Antique Auction, Brush, Colo., (970) 474-3693, (970) 520-5257 or http://www.MichaelAuction.com. 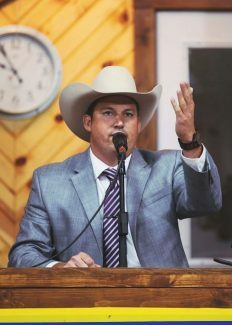 Hay Auction, Burns, Wyo., (307) 635-1995, (307) 703-4020 or http://www.WesternHayBrokers.com. Green Estate Auction, Ft. Morgan, Colo., (970) 842-2822 or http://www.OdleCumberlinAuctioneers.com. Hammack Estate Auction, Scottsbluff, Neb., (308) 436-4056 or http://www.HelbergNussAuction.com. Public auction, Ft. Morgan, Colo., (970) 380-7653 or http://www.AuctionZip.com ID#7082. Living Estate Vannucci Auction, Larkspur, Colo., (303) 663-7491, (720) 454-4440 or http://www.EllenbergerAuctions.com. Gregory Estate Auction, Atwood, Colo., (970) 474-3693, (970) 520-5257 or http://www.MichaelAuction.com. August Antique Auction. Loveland, Colo., (970) 461-9838 or http://www.BeanAndBean.net. AJ’s Sinclair Inventory Liquidation Auction, Torrington, Wyo., (307) 532-4976 or http://www.McNameeBrothersAuctions.com. Consignment Auction, Cornlea, Neb., (402) 923-1160, (402) 920-0168 or http://www.WegenerImplement.com. Newt Welding Liquidation Auction, Loveland, Colo., (970) 356-3943 or http://www.K-WAuctions.com. Chubbuck Arrowhead & Antique Auction, Julesburg, Colo., (970) 474-3693, (970) 520-5257 or http://www.MichaelAuction.com. Torrington Turf Farm Equip. Liquidation Auction, Torrington, Wyo., (307) 532-4976 or http://www.McNameeBrothersAuctions.com. Public Toy Train Auction, Westminster, Colo., (303) 880-3877. See Page 52. Consignment Auction, Castle Rock, Colo., (402) 923-1160, (402) 920-0168 or http://www.WegenerImplement.com. Two Vacant Lots Auction, Greeley & Johnstown, (970) 356-3943 or http://www.K-Wauctions.com. Horse & Tack Auction, Castle Rock, Colo., (970) 415-0726. Farm Toys, Antiques & Collectibles Auction, Byers, Colo., (303) 822-9298 or http://www.LinneburAuctions.com. Hay Auction, Greeley, Colo., (970) 302-0018 or (970) 353-4121.